When, on July 17, I first heard about the tragic shooting-down of the Malaysian Airlines Flight 17 — and the death of the 298 passengers and crew members on board, over eastern Ukraine — I thought of the heart-wrenching anguish the families of the victims must be experiencing. Simultaneously, I felt a disconcerting sense of déjà vu. After all, there is a long list of shot-down aircraft and suspicious plane crashes associated with Moscow: to name only the downing by the Soviets of the Korea Airlines Flight 007 in 1983; or the Smolensk Plane Crash of April 2010 in post-Soviet Russia. The latter case — which saw the death of the president of Poland and his entire entourage (96 members of Poland’s political and military elite in total) in highly suspicious circumstances — shares a striking amount of similarities with the shooting-down of MH 17 over Hrabove (near the Russian border) by Moscow-supported Russian separatists. The differences between the two aerial disasters (Smolensk and MH 17) notwithstanding, the post-Soviets behaved as if they were following the same script. Thus, in both cases the Russians contaminated the crash site, moving the scattered aircraft parts and desecrating the remains of the victims, which were unceremoniously thrown onto trucks by separatist fighters. Adding insult to injury, the post-Soviets despoiled the bodies of the passengers and utilized their credit card information. Thus, even if we accept the explanation that the Malaysian aircraft was shot down by accident, we should still note that the cynical disregard for human life and dignity — implanted in Rus’ by the Mongols, and exacerbated to an unprecedented degree by the Soviet communists — has not changed. In any case, I am convinced that an independent international investigation of the MH 17 disaster is absolutely necessary. As suggested by a former Interior Minister of Poland, such an investigation should be coupled with an independent international investigation of the Smolensk Crash of April 2010. After all, many questions remain, in spite of the passage of four years. Since the post-Soviets have now demonstrated clearly to the entire civilized world the level of barbarism they are capable of, it is worth reexamining Smolensk to ensure that similar tragedies do not reoccur in the future. Note: The views expressed in this commentary do not necessarily represent the views of The Institute of World Politics. They are solely the author’s, and are based on more than a decade of intensive study of Russian and Soviet history. This entry was posted in Poland, Russia and tagged MH17, Smolensk on July 25, 2014 by IWP. In his article published on 11 April in the Daily Beast, entitled “Did Putin Blow Up the Whole Polish Government in 2010? A Second Look,” journalist Will Cathcart mentioned IWP Professor Eugene Poteat, a retired CIA veteran and scientific officer. 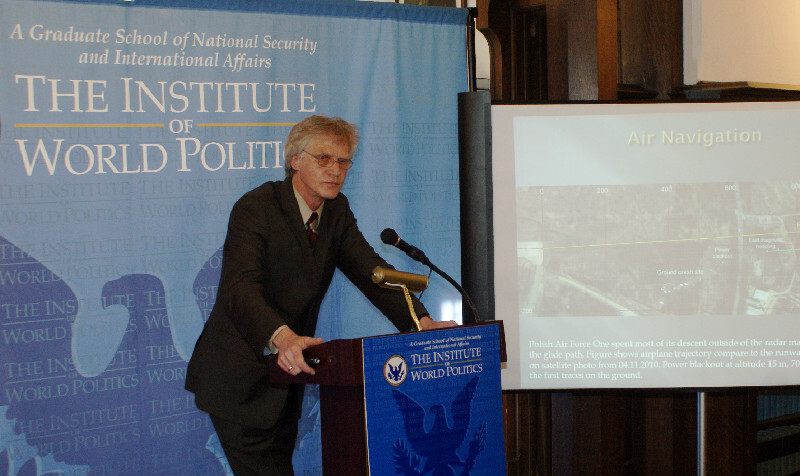 Prof. Poteat has written numerous articles pointing to likely foul play on the part of the post-Soviet Russian regime in the suspicious Smolensk Plane Crash, which occurred on 10 April 2010. The author also quoted physicist Dr. Kazimierz Nowaczyk, an expert on the crash, who delivered a lecture on the Smolensk disaster at IWP on 8 April. This entry was posted in News, Poland, Russia and tagged Smolensk, Smolensk Plane Crash on April 14, 2014 by IWP. The article below is written by IWP student and Kosciuszko Chair researcher Pawel Styrna. The full article can be found on the website of the Selous Foundation for Public Policy Research. After the Smolensk plane crash, the speed with which the disaster became – not unlike Benghazi – relegated to “yesterday’s news” was stunning. An uninformed observer might conclude that what happened at Smolensk was but a minor incident, and didn’t involve the deaths of Poland’s president, and almost one hundred members of the military and political elite of a key U.S.-Central European ally on NATO’s border with Russia. Four years ago the Soviet-built Tupolev 154M jetliner carrying Polish President Lech Kaczyński, his wife and First Lady Maria Kaczyńska, leading a delegation of 94 Polish government officials, including high ranking civilian and military officials, to commemorate the 70th anniversary of the Katyn massacre – crashed on April 10, 2010 killing all aboard before landing at Smolensk, Russia, just east of the Belarus border. “They were supposed to attend a second memorial service,” wrote Professor Nicholas Dima at the time in his article “Katyn Tragedy Redux.” “The first one had been held three days earlier, but President Kaczyński was irritated because Russian Prime Minister Vladimir Putin had invited only the Polish Prime Minister, Donald Tusk, and the Russian leader had not mentioned the Polish officers massacred by the KGB (NKVD). Consequently, Kaczynski wanted a proper ceremony held at Katyn and was on his way to attend it.” There’s a school of thought that believes Kaczynski took the bait and fell into Vladimir Putin’s trap. This entry was posted in Articles, Poland and tagged Katyn, Putin, Russia, Smolensk on April 11, 2014 by IWP. To download the PowerPoint from Dr. Kazimierz Nowaczyk’s recent presentation on the Smolensk plane crash, please click here. This entry was posted in Past Events, Poland, Russia and tagged Smolensk, Smolensk Plane Crash on April 11, 2014 by IWP. On the eve of the fourth anniversary of the Smolensk Plane Crash-which occurred on April 10, 2010 — physicist Dr. Kazimierz Nowaczyk delivered a lecture (part of the Intermarium series) on the current state of our knowledge about this aerial disaster. The lecture took place at The Institute of World Politics in Washington, D.C. The crash killed the Polish presidential couple and almost a hundred members of that pro-American nation’s political and military elite as they flew to commemorate the 70th anniversary of the genocidal Soviet massacre of the Polish elite at Katyn, which — rather ominously — occurred quite close to the crash site. Dr. Nowaczyk reminded the audience of the role of the Russian air traffic controllers, who misled the Polish pilots by telling them that they were “on the right course.” He also emphasized that the Russian rescue units arrived at the crash site very late — about 27 minutes after the disaster. At the same time, the elite Spetsnaz special forces were in the area from the beginning. The physicist also remarked that the thick fog that has become the subject of arguments about Smolensk, was present only around the Severnyi Airport area, but not much farther away that its vicinity. A key piece of evidence to note, he pointed out, is the fragmentation of the Soviet-built Tupolev aircraft and the dispersal of these pieces over a large area. Polish archeologists found approximately 60,000 such fragments at the crash site, which is much more than other cases of aviation accidents caused by explosions. In the case of Smolensk, Dr. Nowaczyk argued that at least “two internal explosions” occurred. Furthermore, the Russians continue to hold on to the black box — which is legally the property of the Republic of Poland — and have tampered with that evidence as well. The Poles were only given copies, which — as it turned out — were missing the last seconds of a crucial minute, which were apparently erased. What these copies do nevertheless show is abrupt violent movement right before the crash. What is more, the traces of the aircraft on the ground are consistent neither with the Russian-generated MAK Report, nor the official Warsaw report, both of which subscribe to the “pilot error/birch tree” narrative. Yet, as Dr. Nowaczyk pointed out, the infamous “iron birch” — whatever its actual maximum height — was located below the location of the aircraft at the time that it supposedly struck the tree. However, even if the plane — which was traveling at the approximate speed of 270 kilometers (168 miles) per hour — had actually hit the birch, it would have sliced through it quite easily. This was demonstrated by Dr. Wiesław Binienda’s famous LS DYNA simulation, which — as Dr. Nowaczyk pointed out — multiplied the hardness of the tree by a factor of ten. The birch tree was thus clearly not the culprit of the disaster. Dr. Nowaczyk’s presentation showed that sufficient evidence exists to revisit the Smolensk Plane Crash — especially in the current geopolitical environment. This entry was posted in Events, Intermarium, Past Events, Poland, Russia and tagged Smolensk, Smolensk Plane Crash on April 10, 2014 by IWP. The New York Times has recently published a letter to the editor entitled “Dismissing the ‘Smolensk Religion,'” written by Kosciuszko Chair Research Assistant Pawel Styrna. The letter criticizes an article by Artur Domoslawski, which attacks those who believe that the 2010 Smolensk plane crash was more than an accident. This entry was posted in News, Poland, Polish History and tagged Poland, Smolensk on December 2, 2013 by IWP.